Bordeaux Breaks the Bank: Are Chinese Aficionados Fueling a Wine Bubble? 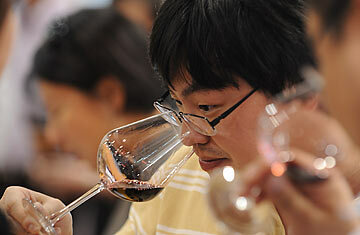 Visitors to VineExpo Asia-Pacific sample wine in Hong Kong, May 25, 2010. This post is in partnership with Worldcrunch, a new globalnews site that translates stories of note in foreign languages into English. The article below was originally published in Le Nouvel Observateur. Asian millionaires' thirst for the best Bordeaux wines has sent prices skyrocketing, and the most prestigious Châteaux have been turning astronomical profits as a result. At a May 17 auction in Hong Kong, new Chinese millionaires were fighting over the few wines that Château Latour  which was rated as First Growth under the 1885 Bordeaux Classification  brought out of its wine cellars. It took Christie's seven and a half hours to sell the 392 lots. Château Latour, which belongs to François Pinault, had planned to stimulate wine collectors' thirsts by putting 19th century wines up for auction, including one bottle dating back to 1863 which sold for 48,730 euros. Was it record high? No. In October 2010, Château Lafite Rothschild, which is located in the great wine-producing village of Pauillac and achieved First Growth status like Château Latour, organized its first auction in Hong Kong since 1980. The highlight of the auction: buyers fighting over a bottle of Château Lafite Rothschild 1869, which was sold for more than 160,000 euros. But selling these almost unobtainable bottles also opens the way for winesellers to hike up the prices of their recent vintages. Christie's sold bottles of Château Latour 2009 for 1870 euros a bottle, three times last year's price. This incredible price surge reveals wine as a profitable investment, and has led to the blossoming of wine auctions in Hong Kong. The most prestigious Châteaux go to Hong Kong to court Asian millionaires, whose passion for Bordeaux First Growths from the Médoc and Saint-Emilion has led to record profits. On June 19, at the Vinexpo  the international Wine Show which takes place in Bordeaux  two worlds will collide: For even while the top Châteaux are booming, more modest Bordeaux wineries are sinking into recession. These exceptional Bordeaux Growths are among big winners of the globalization of the wine market. "These Châteaux are not producing more wine, but the number of people who want to drink a glass of Château-Margaux at least once a year has increased very significantly," explains Pierre Lawton, a Bordeaux-based wine merchant for the Alias trading company. "What is happening is unavoidable. Not a single prestigious Château sells more than 200,000 bottles of its top wine," says Hervé Berland, both owner of Mouton Rothschild and manager of Rothschild properties in the Philippines. "The wine market is increasingly globalized, we cannot fight that. If we want to sell less wine in China, they will go somewhere else to find it." Is this Chinese-spurred speculation creating a Bordeaux bubble? The Châteaux want to believe that the wine market does not follow the traditional rules of economics: supply is very limited whereas demand is unlimited. Hong Kong and China have become the two leading destinations for Bordeaux wines. Last year, according to the Bordeaux Wine Bureau, Hong Kong and China represent 27.5% of wine exports in the world. The wine industry started booming in March 2008 when Hong Kong abolished wine taxes. The former British colony has become the world's number one market for the most expensive wine exports, followed by the US and UK. That explains why auction houses have flocked to Hong Kong. "The Chinese buyers are seeking the prestige of having high-end wines," explains Charles Curtis, Head of Asia Wine Sales at Christie's. "This year, we are going to organize six auctions in Hong Kong. Last year, there was just one." Asian buyers have made a real, almost fetishist, cult of Lafite Rothschild. It may be in part the prestige of the Rothschild family, as well as the fact that this wine has been exported to China for a long time. "The price difference between Lafite and the other wines is so huge that many people decide not to drink them and resell their bottles instead to buy others," explains Angélique de Lencquesaing, one of the founders of the iDealwine.com website. She says a bottle of 1982 Lafite Rothschild worth 3,500 euros in France sells for 5,000 euros in Hong Kong. Speculation is spreading even among wine lovers in Europe. Says Olivier Bernard, owner of the wine merchant company Millésima: "I think that 35% of European private sales are speculative. In reality, the cases are resold in China." See how to pair the right wine with Asian food.